When it comes to the best die designs, Sizzix is a name that quickly comes to mind and at CraftDirect.com, Jen Long is one of our very favorite designers. Take advantage of great low prices here. She does wonderful cardstock designs as well (she collaborated with Pebbles on those)! Among her most popular products are her collection of Textured Impressions folders and Thinlits dies, great for making cards. 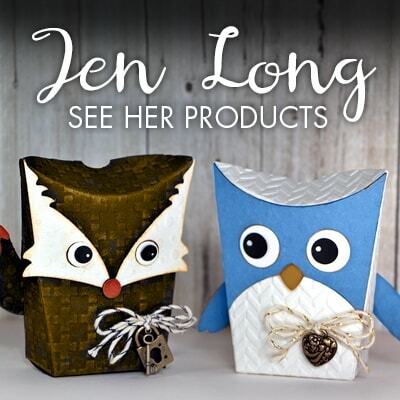 Save with CraftDirect.com when you buy the best deals online on Jen Long dies, folders, and more. One of our favorite collections of Jen Long Sizzix dies is the new In Bloom. It includes a number of Framelits, Thinlits, coloring stickers as well as clear stamps (you need an acrylic block for precise stamping). Her Fold-a-Long cards are also one of her most popular solutions for paper crafters. There are animal themed ones, like a Fox and an Owl, but there are also more generic themes, like the Botanical Label. Maybe what she is most known for, her various stamp sets are amazing! They are reusable and great for any number of paper projects, like scrapbook layouts, greeting cards, home decor, and more. She is an experienced designer in a variety of areas. She worked/interned at Disney, specifically doing Phineas and Ferb art. She studied and taught at Cal State Fullerton. Now you know and love her paper crafting product designs.